Everyone loves chocolate truffles. They are the perfect holiday gift and a most welcome bring along party accoutrement. We buy them by the ounce at great expense but they can be made at home inexpensively. 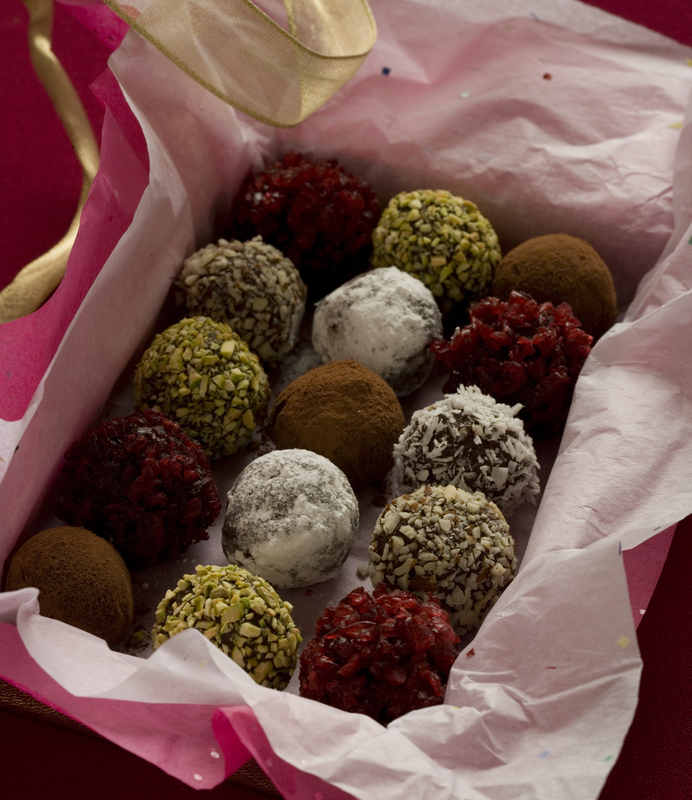 The secret about chocolate truffles is that they are so easy to make. The recipe is little guarded, but it is the presentation that will really make you a star. Regardless, these little mouth melting gems of sensuous delight are sought after and can have a huge impact on the success of your dinner party. The simple recipe is equal parts heavy cream and a very good dark chocolate, preferably at least 72-85% so that it is not too sweet. First, chop the chocolate into small pieces for easy and even melting. In a sauce pan, heat the cream slowly over low heat, never letting it boil. Take it off the heat and add in the chopped chocolate. Stir it slowly until the mixture is completely smooth, then let it cool in the refrigerator until it is firm, about one hour. Scoop one inch balls onto a wax paper lined tray with a #100 release style scoop. 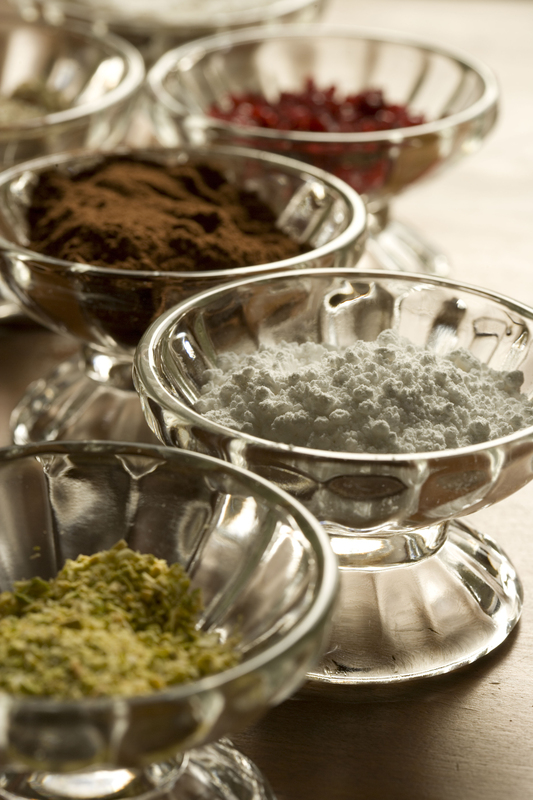 Roll them into your coatings of choice, such as cacao powder, ground nuts or coconut, powdered sugar or finely chopped dried fruits. Place them into paper lined decorative boxes for an elegant presentation. Refrigerate until your are ready to serve them. The variations in flavor and texture are the infusions and the coatings. While heating the heavy cream you can add vanilla beans, spices or liquor infusions, as you like, such as citrus peels, fruit essences, extracts, cognac or rum, etc. All of these will be about your taste, imagination and creativity. You may want to strain the hot cream to take out any flavor particles, once infused, to keep a smooth texture. For party favors you might choose many variations to please the crowd. Tiny candy cups from your party store are available to serve them in, as a presentation alternative. They look like tiny cupcake cups and come in a variety of colors. Put them in small boxes, single layered, lined with colored tissue paper. They will be a hit at yours or any party. This recipe is really a basic ganache, which is quite versatile. While it is still warm you can pour it over a cake or cup cakes. Once cool, it becomes an elegant, glossy, firm delicious coating. You can also choose to spoon it over ice cream for a rich sundae topping, or layer a fruit parfait. It will keep in an airtight container in the refrigerator for months for later use. What ever you choose, it will be fun and delicious.